"The final act of your life is murder. But which one of us?" Please click here for the article on The End of Time Part One. It’s funny how the NEXT TIME trailer on Doctor Who can make me imagine all sorts of scenarios for how the next episode will play out. It’s also interesting in equal proportion to how the episode actually plays out. The NEXT TIME trailer for The End of Time Part Two had all sorts of ideas floating in my head about how the episode would look and what the storyline was all about. It looked to me that the Time Lords would return, as they promised at the end of Part One and somehow take the Doctor and put him on some sort of trial. I assumed that The Lord President of the Timelords was speaking directly to the Doctor when he said, “The heartbeat of a Time Lord.” The Doctor is all battered from possibly being interrogated. My imagination was on fire. There is nothing better than one’s own imagination to come up with great ideas. In reality, the episode didn’t quite reach that potential which is not the fault of the episode. It simply chose to go a different direction than that of my imagination. The End of Time Part Two obviously picks up where Part One left off. The Master has basically turned everyone on the Earth into him with the exception of Donna, Wilf, the two Vinvocci and of course the Doctor. There is a confrontation between the Doctor and the Master. It’s a really interesting scene because it’s a very heart to heart sort of talk. The Doctor really respects the Master but the Master has the upper hand. Eventually the Doctor escapes with Wilf and the Vinvocci in the Vinvocci spaceship which is hovering above the earth but much more malevolent things are afoot. The Time Lords are facing the last day of the Time War. They know that they are about to become extinct. The Lord President is adamant that this will not happen. What is slightly disappointing to me is that the Time Lords technically haven’t return. What we are seeing is the past. What the Time Lords will eventually plan will bring us to the present. Even though I say it is disappointing, it only is so to my own imagination. The reasoning of where this scene takes place is perfectly logical. All the scenes set on Gallifrey are beautiful. Everything has a bronze, orangey-red texture to it. It is opulent yet decaying. The opening shots show the same Time Lord Citadel we saw in The Sounds of Drums but this time, it is heavily damaged with destroyed Dalek ships cluttered and strewn about on the surface of Gallifrey. It is clear that everyone fears the Lord President but the reason becomes clear by the end of the episode. Upon hearing that this is the last day of the Time War, the Lord President wants immediate action on how to stop their destruction. Suddenly an idea presents itself. So simple but so effective. Ever since the Master returned in The Sound of Drums, he’s had a sound beating in his head that is driving him insane. This was never referred to in the classic series. Now as the Time Lords face final death everything becomes clear as they send the drum beating sound back in time and instill this sound into the Master’s head so he’s had this all of his life. For the fan in me, I really like this because, to me, it means that the Master we knew in the classic series never had this sound. The insinuation is that the Master was more insane than evil partly because of this beating sound in his head.. I think having the Time Lords put this into him and using him for their survival is quite good. Now with the beat implanted in the Master, who is outside of the time-locked Time War, he is essentially a homing beacon. What makes contact between him and Gallifrey is something very small which can break through, a White Point star which is only found on Gallifrey. Now with it, the Master can set up the portal between Earth and Gallifrey and bring over the Time Lords with the intention of turning all of them into Master people like he did with everyone on Earth. Meanwhile on the Vinvocci spaceship in orbit above the Earth, the Doctor learns of the plan via the Master boasting to the Doctor on all radio frequencies. The Doctor jumps into action and takes the ship back to Earth. It gets a little dicey here. We see a great combat scene with Wilf taking the role of a fighter pilot while blowing up missiles that are targeted on them. It’s fast paced fun and done extremely well. Now, instead of landing the ship the Doctor jumps out of the ship and ends up free falling about 150 to 200 feet before crashing through the skylight of the Naismith manor and landing in the room with the Master and the Time Lords. I hate to put on my diamond logo Doctor Who T- shirt (which is 2 sizes too small) here but in Logopolis, the Doctor falls a great distance from the Pharos Project radio telescope dish which that alone causes him to regenerate. How can the Doctor survive the crash through glass and another 20 feet here? Now, the Doctor is quite bruised, cut and bloody but the fact he could move at all is simply shocking! The Doctor stands between The Master and the Timelords. He has a gun that was given to him by Wilf and he is either going to use it on the Master or the Time Lords. Luckily the Vinvocci got off their asses and took the time to finally land their ship so Wilf can join the Doctor. 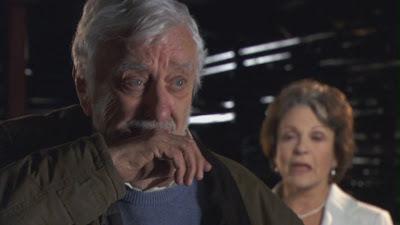 Its unfortunate Wilf didn’t just go home. The Lord President turns all the Master replicas back into human beings. The Time Lords want to bring about the end of time so they can ascend from their physical forms into higher intelligence void of any physical embodiment. 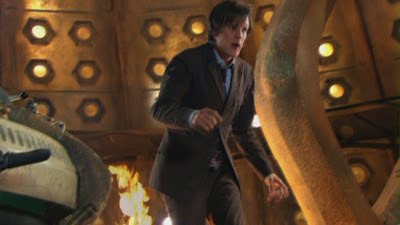 Wilf, trying to help, sees someone trapped in a chamber which has two sides. One person is in the double chamber at a time but to let him out, someone needs to go into the other side hit a button and release them. Wilf does exactly this which releases the one guy but Wilf is now trapped. Someone will have to do the same thing for him at one point. Now, we come to what I think is the defining moment of the Tenth Doctor‘s era. The Doctor needs to decide who he needs to dispose of to stop the Time Lords plan. Everything about this is just wrong for the Doctor’s character yet he has no choice and he needs to make the decision. He has a gun and it looks like his own option is to kill. It may even need to be the Master. This scene chokes me up; it is very tense. It isn’t until he sees the woman on the side with the other Time Lords reveal herself and nods to something that it suddenly becomes clear to the Doctor what to do. He shouts to the Master, “Get out of the way!” and shoots a piece of machinery which starts to reverse the hold the Time Lords has on the Earth. As the Time Lords start to disappear, the Doctor reveals the identity of the Lord President as non other than Rassilon himself probably resurrected like many other Time Lords to fight in the Time War. 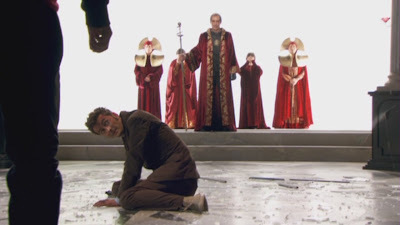 Rassilon knowing he has lost is quite content taking the Doctor with him until the Master intervenes. The Master starts firing energy bolts on Rassilon as revenge for ruining his life with the sounds of drums beating in his head. It’s a powerful and moving scene which had me cheering for the Master. It is very reminiscent of Return of the Jedi with Darth Vader turning on the Emperor. All the Time Lords and the Master disappear. Gallifrey, which is MUCH bigger than Earth, vanishes from orbit around the Earth. It is over….. The Doctor is overjoyed. He is still alive. He was told his life would end soon. He was sure this would be a no-win situation. As he is happy and smiling to himself, suddenly he hears four meek knocks on glass. His face loses his grin which turns into a grim realization. We hear the four knocks again and again. I remember the first time I saw this on New Year’s Day 2010, a friend I was watching with gave a sad remorseful oh. We all knew who was knocking. Even though we heard about the four knocks as far back as Planet of the Dead and that a big deal had been made of it, a lot of us completely forgot about it after all the main action was done. Of course, the four knocks were Wilf trapped in the chamber. The Doctor would need to release him but the chambers are overloading with radiation which will kill Wilf if left in there. It will also kill anyone who goes into the other side to release him. The Doctor apparently really does love himself and is furious that Wilf had to go into the chamber. The Doctor is furious that he now has to rescue Wilf and end, at least, this current life. It is raw emotion that I feel is a little out of place. Wilf was trying to help the other man who was trapped in there. 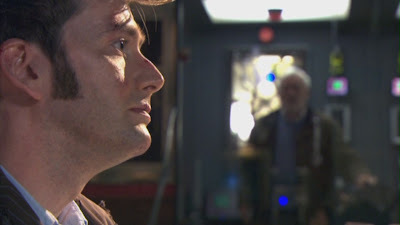 So, even if Wilf did not get trapped in the chamber, the Doctor probably would have needed to rescue somebody. When the Doctor releases Wilf, it floods the compartment the Doctor is in. He slumps to the ground and stays there as if dead. Finally, he gets up. He knows its starting, he is starting to regenerate. He is off to get his reward before the change is complete. The reward is a long sequence where he visits all the people in his (tenth) life who were important to him. This includes Martha and Mickey who are now married, Sarah Jane and Luke, Captain Jack and Verity Newman whose grandmother was The Doctor’s love interest in Human Nature/The Family of Blood. We also see Donna’s wedding in a very sweet scene of the Doctor giving them a lottery ticket bought with money he borrowed from Donna’s deceased father. We also go back to where it started at the Powell Estates in 2005 so the Doctor can visit Rose. He doesn’t mean to actually see her but stays in the shadows. I think they missed a trick when the Doctor says she will have a brilliant year, I wished he told her she was going to have a fantastic year. Finally the regeneration gets going. The Doctor is helped by song from the Ood into the TARDIS and he takes off. As the regeneration kicks in, the tenth Doctor says his final line, “I Don’t Want to Go!” and regenerates and what a regeneration it is. 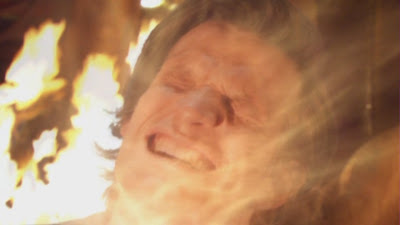 Due to the radiation he was exposed to, the Doctor explodes out energy in a gigantic burst which almost destroys the TARDIS creating huge fires. Part of console room collapses but the change is made and there is a new Doctor. 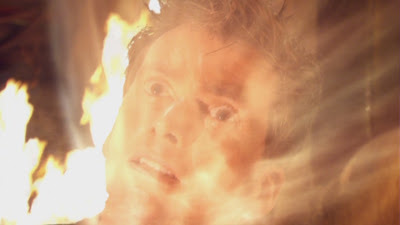 It is interesting that for both Doctor regeneration stories Russell T. Davies wrote, the main villain or monster was not the direct reason for the Doctor regenerating. In Parting of the Ways, it was not the Daleks who caused the Doctor to regenerate, it was saving Rose’s life and removing the vortex from here. For the Tenth Doctor, it similar in that the Time Lords nor the Master were the direct results but more from what happened with Wilf. I kind of like this. There is something grand and rather epic in scale between this Doctor and this version of the Master facing each other. It seems like both know that neither of them will survive and maybe one of the best pairing of the Doctor and Master in the series history. Maybe it’s because they have been in a story before but not many stories. It almost seems like a re-match. 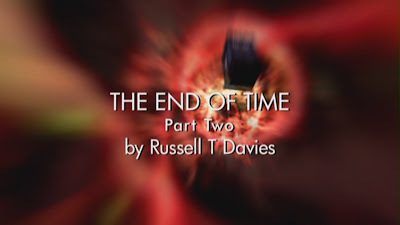 One thing I wish Russell T. Davies kept in was, according to The Writers Tale: The Final Chapter, the Daleks were meant to appear and create an alliance with the Time Lords. They also did not want to die and we would have seen in essence a Dalek Parliament. I could see Russell making this work. Unfortunately, it didn’t happen. Russell spoke with new showrunner Steven Moffat if he was planning on using the Daleks in Series Five. Moffat was but didn’t tell Russell he couldn’t use them; at the end of the day Russell didn’t want to steal Moffat’s thunder with there return in Series Five. Fair enough. Ultimately, The End of Time Part Two got massive ratings for BBC1 and ended the Tenth Doctor era on a massively high note. Next week: A look at Matt Smith’s introductory story The Eleventh Hour, How I Met Matt Smith and a tribute to writer Tom Mankiewicz with a look at the Bond film Live and Let Die.